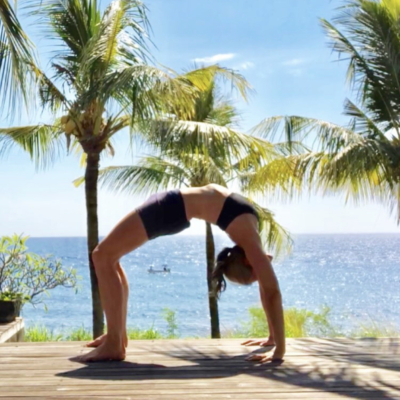 WHETHER YOU ARE ALREADY A BACKBEND LOVER OR WOULD LIKE TO BECOME ONE, WE DIVE INTELLIGENTLY INTO THE BIG HEART OF BACK BENDING IN THIS WORKSHOP. EXPLORE MOVEMENTS WITH WISDOM AND RESPECT FOR EACH INDIVIDUAL’S UNIQUE BODY TO REVEAL A MORE EXPANSIVE AND LIBERATED SELF. EXPAND YOUR KNOWLEDGE AND PRACTICE AS WE AWAKEN AND ENGAGE THE BODY TO STABILIZE AND SUPPORT THE POSES, AS WELL AS STRETCH AND OPEN THE MUSCLES OF THE SHOULDERS AND FRONT BODY TO CREATE PREPAREDNESS AND EASE. WE BEGIN WITH A FLOW AND FUNDAMENTAL BACKBENDS TO WARM THE BODY TO PREPARE TO LEVERAGE DEEPER OFFERINGS; WE WILL THEN MOVE SAFELY TOWARDS INTERMEDIATE POSES, INCLUDING EKA PADA RAJA kapotasana, URDVHA DHANURASANA, DWI PADA VIPARITA DANDASANA, AND DROPBACKS. LEARN APPLIED ANATOMY AND KEY ACTIONS, AS WELL AS MODIFICATIONS AND VARIATIONS TO GAIN COURAGE TO ACCESS POSES WITH SUPPORT. WE CONCLUDE OUR EXPERIENCE WITH A MEDITATION ON THE LOVING AND WISE HEART, AS WELL AS A GROUP REIKI SESSION. Amy’s passion is cultivating bliss and revealing inner radiance through the wisdom of yoga. She is known for her fun yet challenging vinyasa classes, enhanced by a thoughtful balance of alignment and insight into the broader context of yoga. Amy’s training includes 200 and 500-hour YTTs with Hatha Yoga Center and Noah Mazé, as well as Integrated Movement Therapy and Reiki. She is an emissary and certified instructor in the YOGAMAZÉ method and is registered with Yoga Alliance at the E-RYT500 level. She has been a lead instructor on several teacher training in Seattle, Tacoma, and Bali. Amy also has a degree in French literature and an M.A. in teaching and is a mom to 2 fabulous teenagers. Additionally, Amy loves all things Bali and offers retreats and teacher training from her home and studio there.